Mighty Mule Heavy Duty Gate Operator for Double Gates - 850 lbs. 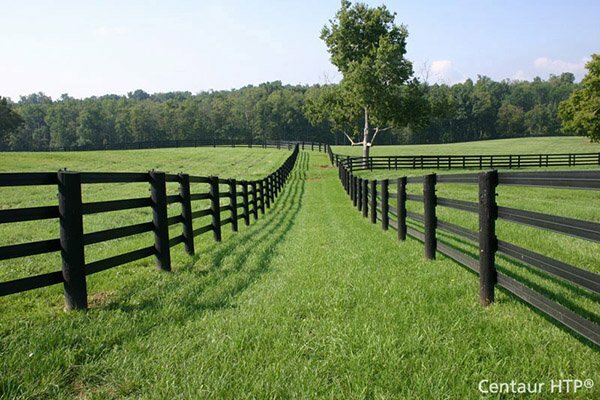 / 18 ft. Each Gate | Hoover Fence Co.
Internet Special! You won't find this deal at any big box store! Low voltage swing gate operator designed for tubular steel, vinyl, wood, or ornamental gates for residential and light commercial use. The Silver-HD-Dual is for double swing gates up to 18' long and 850 lbs. per leaf. The Silver Anniversary Series Operators are available exclusively for Professional GTO/Mighty Mule Distributors/Dealers. The operator includes extra items you would normally have to pay additional charges for. GTO offers these operators as an alternative to their top-of-the-line GTO/PRO Operators for budget-minded consumers that want value at a discounted price. 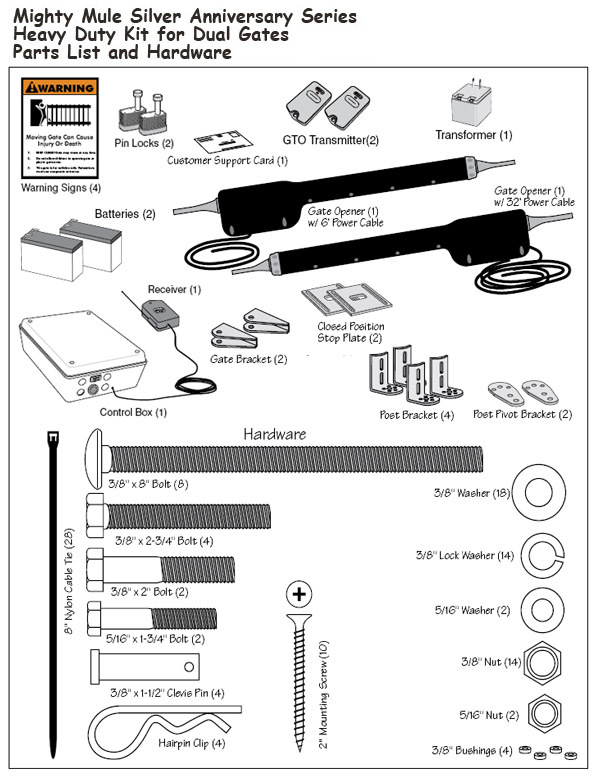 12 volt system, no electrician required - Easy operator to install for the "do-it-yourselfer"
Designed for gates that open into property (pull-to-open) or away from the property (push-to-open). UL rated for Class I, II, III, and IV. System certified to be in compliance with UL 325, 4th edition. 12 month limited warranty applies to replacing parts from GTO, Inc.
Low friction screw drive (linear actuator). Temperature rating of motor: -5°F (-28°C) to +160°F (+71°C). Powered by a 12 V motor with integral case hardened steel gear reducer. Motor speed reduced to 260rpm. Generates 680 ft. lb. of torque at 12V. Maximum opening arc of 110°. Approximate 90° opening time is 18 to 20 seconds, depending on weight of gate. The Silver-HD-Dual system is powered by a 12 volt DC/7.0 amp hour, sealed, rechargeable lead acid battery. Battery charge is maintained by a 120 Vac, 18 Vac output transformer rectified to 14.5 Vdc (40 VA) through the GTO control board. One (1) blade-style control board fuse is rated for 25A. NOTE: The transformer should not be directly connected to any battery. Do not replace fuses with higher ampere rated fuses; doing so will void your warranty and may damage your control board. Silver-HD-Dual is capable of using solar panels to charge the battery. Battery charge is maintained by GTO Solar Panel Charger: float voltage of 14.5 Vdc output from a 19-3/8 x 8-1/2" silicon alloy panel. Generates minimum of 5W at 300 mA. A gated diode on the control board prevents battery discharge. GTO microprocessor-based control board is set for single leaf, pull-to-open gate installations. DIP switches can be adjusted to accommodate an optional kit for push-to-open gates. Control board has temperature compensated circuits. A circuit in the control board regulates charging. "Sleep Draw" is 40 mA; "Active Draw" is 2 to 5 A.
GTO remote-mounted RF receiver tuned to 318MHz. Opener length with push-pull tube fully retracted is 40-1/4", mounting point to mounting point. Adjustable auto-close timer (OFF to 120 s), and obstruction sensitivity. Power terminal block accommodates a transformer and solar panels. DIP switches simplify setup of gate opener. Accessory terminal block fully compatible with push button controls, digital keypads, safety loops, etc. Control board allows connection of safety edge sensors and photoelectric sensors. Audio entrapment alarm sounds if unit encounters an obstruction twice while opening or closing.